As part of the audit of the Creditreform Gütersloh, WA Notstromtechnik GmbH has been certified by the credit certificate CrefoZert as a manufacturer of emergency power sets and network replacement units with a good credit structure. In times of increasing economic uncertainty, it is difficult for suppliers to assess the credit risk. When the CrefoZert is awarded, the most recent annual financial statements are reviewed and the management is consulted to certify an objective creditworthiness to the company. 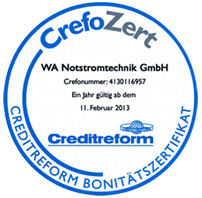 WA Notstromtechnik GmbH performed well in the balance sheet analysis and can therefore satisfy suppliers and customers with a positively tested credit rating.